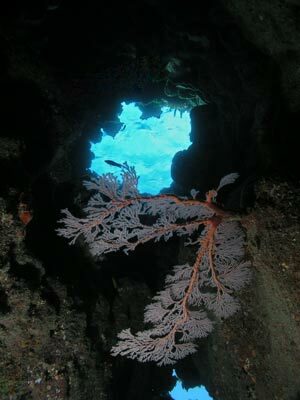 Pixie Gardens dive site is located off the western side of the southern end of Ribbon Reef Number 10. It is 173 kilometres north-north-west from Port Douglas. A GPS Reading for the site is S14° 55' 42.9" E145° 40' 39.2'. The dive site consists of a main reef which is broken up into some larger bommies (creating canyons) and some small and large bommies off the main reef. The mooring is located at about 8 metres on the main reef. 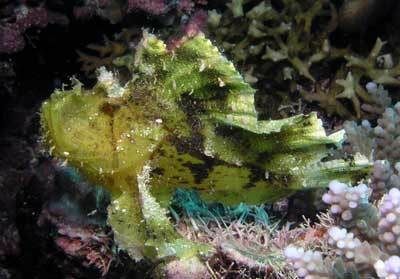 The highlight of this dive site is that you can see leafy scorpionfish here. From the mooring, head north along the wall and after the first larger bommies you will see another smaller coral outcrop a few metres off the main reef. This has coral growth all over it (sort of small finger like corals - see the photograph of the leafy scorpionfish at left below). 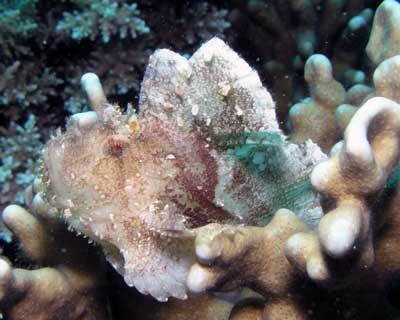 Look carefully and you should find one or more leafy scorpionfish. On our dive here in November 2006 we found three on this bommie (depth 12 metres). Go further north and you will see some more small bommies. 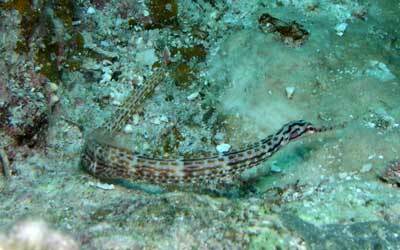 Once you see a huge coral outcrop like large broom handles, turn around and head south. 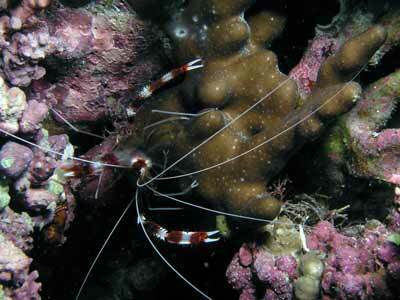 Follow the main reef and you will see that there are many small coral bommies and some nooks and crannies in the reef. The depth will come up to about four or five metres. Head back a bit deeper and you will encounter the main wall again. Follow this and you will see a couple of canyons that lead up into the reef. The first one is quite long and then next one not as long. Worth exploring and taking photos. The mooring is attached to the main reef just past here. Take note of its location. There are a couple more canyons further on, all worth examining. Once you have run out of time or air. go up onto the reef wall and spend some time at five metres. There is a lot of nice coral here. Go back to the mooring and ascend. The visibility here does not appear to be great. We had about 10 to 12 metres at the best. Fishlife was pretty prolific. It is also a good night dive spot. You will not find the leafy scorpionfish as they appear to hide at night time, but there are lots of tiny crabs, shrimp and other fish to see. 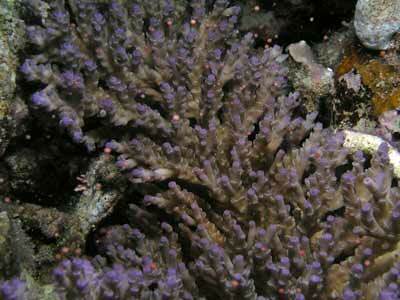 On my dive here in November 2006 we saw one coral spawning, releasing eggs into the water (see the photo). This was three days after the full moon. Fantastic.